Motto: "Love is a leveler"
Kida is Mikado Ryuugamine's childhood friend and resident of Ikebukuro. Kida is an easy-going guy and appears foolhardy at times. He is 15 years old and is in class 1-B. 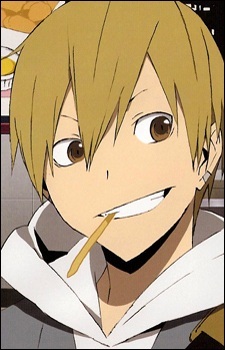 Mikado says that Kida used to be very energetic in elementary school and describes him as being quite charismatic. Kida seems to know many of the residents of Ikebukuro and he functions as a guide to Mikado. He enjoys flirting with older girls and women although his passes usually aren't taken very well. He was the leader of the gang: Yellow Scarves. During his reign, he is referred as "Shogun" (i.e. "General") although he doesn't seem like to be referred to as that title. He is very strong fighter as demonstrated during the coup of the Yellow Scarves; he took down several opponents with crowbar before collapsing due to a wound on his head. He left Ikebukuro with Saki at the end of the third novel, but joined the chat-room using alias "Bakyura" to keep in touch with Mikado. He is now working with Saki for Izaya. He returns during the eighth novel and Mikado tells Kida to stay away from him and not to get involved with the current affairs.